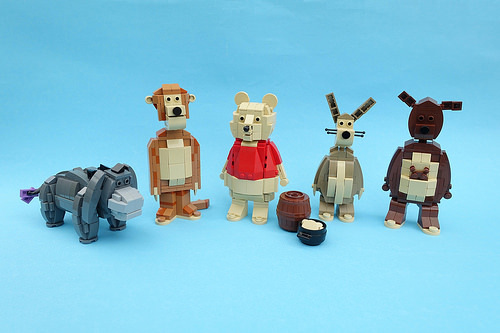 Builder Patrick B. is taking us back to a fond childhood memory in the Hundred Acre Wood with this quintet of beloved characters from A. A. Milne’s Winnie the Pooh series, consisting of Eeyore, Tigger, Pooh, Rabbit, and Kanga and Roo. Oh joy! The ears are the standout technique on each of the characters, made of various tiles and slopes, but my favorite detail is Rabbit’s whiskers, made with lever handles. Bonus fact: Winnie the Pooh was translated into Latin in the 1950s, and Winnie illie Pu proceeded to become the only Latin-language book ever to make it to the New York Times Best Seller list.